Are you a final year social science student who has to do a dissertation or final year project? Do you have no idea where to start? 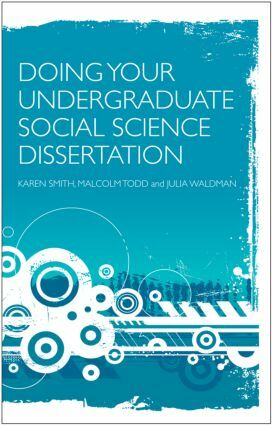 If so, Doing Your Undergraduate Social Science Dissertation is the book for you, covering the whole dissertation journey from project planning to submission. Using a mixture of useful information, exercises, practical strategies, case study material and further reading, it helps you through the process, giving hints and tips on beginning and managing your research project and working with your supervisors. Packed with proven practical advice, it also identifies many other sources of information and resources, making it your most dependable starting point and guide on your dissertation journey. Also included are links to accompanying materials on the Routledge website. The authors have extensive experience in teaching at all levels in the social sciences, supervising social science undergraduates and dissertations.